Photo by Scott Suchman, shamelessly pinched from here. Counting this evening, just three more nights in the Shakespeare Theatre's production of Merchant of Venice. A triumph of this interpretation is it's the first time I've seen Merchant performed in which my sympathies weren't entirely with Shylock. A perennial problem for this play is that it's not actually about Jewish-Christian relations at all, yet that's all we moderns see. 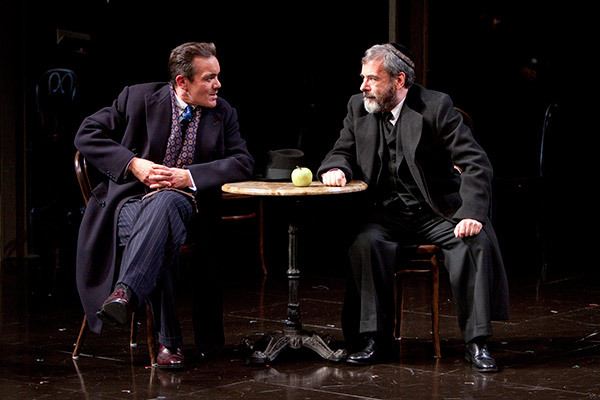 Contemporary performances usually play down Shylock's negative traits, leaving us with a tour de force performance from whoever plays Shylock as the Victim of Society. It's a tribute to Mark Nelson's performance and Ethan Sweeney's direction that this is the first time I've watched the trial scene and understood that Shylock's ruination is not an injustice, but Shakespeare's illustration of the scriptural warning: "with the measure that ye measure will ye be measured." Shylock is shown no mercy not because the Christians are out to get him, but because he himself has insisted repeatedly that no mercy be shown. Julia Coffey makes a wonderful, three-dimensional, lively Portia and it was a thoughtful and moving evening at the theater. My only hesitation is that I've come to believe the play is about the sacraments: the bloodless flesh offered in atonement for another, the rings of marriage not fully meaningful until the Christ-figure, Antonio, is the pledge of them.....Once you're convinced of this interpretation (pp.45 ff), it's hard to be satisfied with others.